Angie Echele is one of our Preschool teachers that creates a magical place for our three-year olds to explore and develop physically, socially, emotionally and academically at their own pace. Mrs. Echele is now one of our Co-Directors of our preschool program. She has worked in the preschool for the last 18 years and holds a B.A. and M.A. from the University of Evansville. 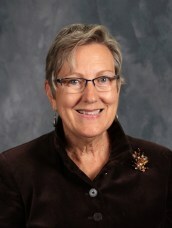 She also holds a lifetime teaching license and very much enjoys working with young children. She has been married to her husband, Jerry, for 45 years and they have seven wonderful children.